It has been raining just about the whole week. Much more and I’ll be able to just pour laundry detergent down the steps onto the cellar floor and let the piles of clothes wash themselves. We can’t do yard work and I am not a shopper. What does that leave? Crafts, right? Pulling out some fabric, maybe a little scrapbooking, getting really crazy and painting a picture frame. Stop. Right. There. Remember when you were in elementary school and there were so many fun activities to look forward to? For instance, Arts & Crafts. Weren’t you so excited to get to that time of the day where you actually had permission to dive into multi-colored paper and glue and scissors? Here’s the first clue that Arts & Crafts was not a fun time for me. I am left-handed. Oh yeah. I have flashbacks of my five-year-old frustrated grip on unrelenting purple or red rubber handles, attempting to hold a carefully selected section of thick construction paper in my right hand and make a reasonably normal cut with those pieces of mystery metal slapped together with a fake screw and primed with sand. It was the time in my life when I learned to growl. At such a young age I wasn’t aware that this was the first sign of having not one craft gene. I mean none, nada, zero, zilch. My sister got it all. She is that combination of Martha Stewart and MacGyver (or Jack Bauer if you're born after 1990) that can transform a few staples, thread, rolled up newspaper and a piece of toast into the perfect Christmas present. She paints, sews, makes jewelry, and her house is in constant rotation to stylishly fit the season. Right now this whole non-crafty thing is being drilled even more into my head since, during a moment of weakness (insanity), I volunteered to work on decorations for YK’s upcoming final senior celebration. Decorations. What was I thinking?? Ask me to whip up a steaming pan of irresistible lasagna and I’m your girl. Put paper, scissors and directions in front of me and I start to hyperventilate. What’s the opposite of symmetrical and straight? Oh, right – every craft I have ever tried to finish. Like any well thought out big project with a definite deadline, we now have just a few days left to transform cardboard and glitter into grandeur. As you can imagine, nobody is counting on me to pull it all together. I am perfectly capable of punching out holes (perforated – don’t make me have to cut something out raw) and taping separate pieces of material (with clearly measured lines) together. Or I can go get lunch for everyone - that would probably be better. When my daughters were very young (and non-judgmental) they loved to have me sit down with them to color and glue and throw sparkle around. As years went by and they could determine the difference between Mommy crafting along with them and Mommy spending most of the time scraping up the error of her gluing ways from the kitchen table, or picking up the box of toothpicks her elbow relocated to the floor, they sort of stopped asking. This defect of mine did not spread to them, thankfully. We didn't always recognize which animal they had molded in art class and proudly brought home to display, but they managed to get through school without burning down the woodworking class or baking a hole into a wall of the home ec room (now labeled something like “family and consumer science” which sounds even scarier). Today both girls are creative, confident young women who did not inherit my aversion to measuring tape and glue guns. Because I want to better myself (and because it's too late to wrangle anyone else into doing this) I hope this week to establish that a craft I am working on will end up looking like it’s supposed to look… mainly because I am the directee and not the director, and then only under strict supervision. In all sincerity, I am enjoying being a part of this project in a don’t-leave-me-alone-with-this-diagram way. It’s a kick to help with my baby girl’s last blowout before graduation, knowing her class will have a great time on the night of the festivities and all the decorations will be worth it. This, however, is anything but the beginning of my foray into embossing, snipping, stamping, or collaging. Having owned that, I was completely unprepared for one thing. Can’t we just give blood? I recently (five hours ago) attended a 50th birthday party for none other than Mrs. Von Trapp DIY. It was much fun and good food, lots of laughing and reminiscing over family photos. We were just relaxing and talking about kids and jobs and life in general… when there was an announcement from one of her children that almost sent me screaming into the ladies' room. My palms began to sweat. People were staring at me, I was sure of it - my reputation having spread through town over the years as the uncrafty mom. I suddenly wondered why I was not drinking wine. Wine might have helped me power through this intimidating activity, and it would also be the perfect excuse for why the end result was so bad. But it was too late, that ship had sailed and all I had was ice water to clutch. Not even a slice of lemon swirling around. 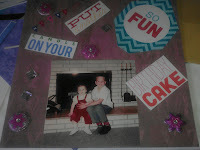 I walked up to the table covered with sticky jewel shapes, photos and cards with sayings to cut out and glue (with a glue stick – I could handle a glue stick) and a book of crafting paper. Genuinely crafty people were clipping out shapes and sayings and framing their paper, color coordinating and effortlessly stick gluing and tossing about their fake jewel flowers - which naturally fell onto the page in perfect symmetry. My head began to spin. There were at least four others around the table at the time so I slipped quietly away in the hopes that everyone else would make enough so my friend wouldn’t care if I didn't. Eventually it cleared out and I felt guilty for thinking only of myself and my own perfectly warranted fears. It was time to think out of the box… as long as I didn’t have to neatly fold it up afterward. Leaving S to talk with other husbands about beer or something, I strode with purpose to the craft table, bound and determined not to leave until I had conceived a decent representation of this birthday celebration. With photo chosen and (thank you, craft gods) perforated crafting paper successfully removed from the book (from past experiences, I know better than anyone that “perforated” is in no way a guarantee), I started the search for the perfect combination of happy and birthday. The final result is not as frightening - or even as crooked - as I feared it would be, as you will see from the picture. There is now the tiniest shred of hope that I could enter Michael’s Crafts and not be asked to leave, or sign up for the Sea Glass Mosaics class at Adult Ed (sea glass is rounded and probably perfectly safe) and not have my name flagged to notify the registrar to send me a “class full” notice. I could volunteer on parade floats and 250-year-old neighboring town celebrations! I’ll probably just bring lasagna. Are we anywhere near there yet?